The triple name ring is a unique mother's ring stamped with names. Be creative and put "my boys", "my girls", "family", "love", the parent's names or the spouses' name on the third band. The triple name ring is a wonderful gift for the mother of two. If you like the look of the triple or know you want to have a third child later - the triple name ring is a great option! Put the kid's names on two of the bands and the parent's names (or just your partner's name) on the third band. 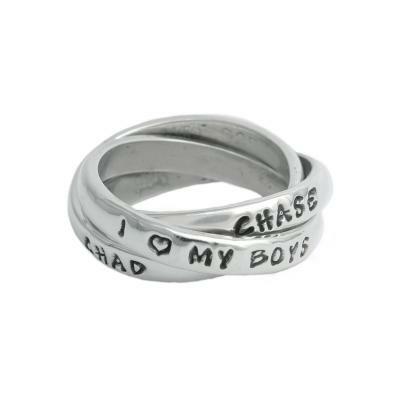 Or for a mom of two kids put the names on two of the bands and "my boys","my angels" or "my girls" on the third band. Or you can just leave the third band blank - if you have a third child, you can send it back to have the new name stamped at a later date for a small fee. Sizing: When determining your size, we ask that you give us a size that is a snug but comfortable fit. If you are unsure of your size, you can purchase a ring and select ring sizer from the dropdown menu. We will send you a ring sizer and instructions on how to email us your size. The ring turned out better than I had imagined! I was also very impressed with how quickly we received the ring. I will definitely be ordering from Nelle & Lizzy again! I love my ring! I will wear this for many years to come! I look at it and think of my boys.